As one would expect, the XPS 13 of 2019 is marginally better than last year’s model in just about every category, particularly battery life. Much of the hardware inside is nigh identical to last year’s if not just barely better. For instance, the processor inside is only the latest iteration on the 8th-generation series of Intel processors, specifically the Intel Whisky Lake Core i7-8565U in here compared to last year’s Kaby Lake R Core i7-8550U. Both processors operate at the same frequency, but the newer model is more efficient within the same power profile and therefore slightly stronger. You can see this in our slightly improved PCMark 8 Geekbench 4 (Single-Core) results, whereas video performance gains are negligible at best as expected. Just like last year, this model uses the same Gore insulation found within the Mars rover for better thermal management and therefore stronger theoretical performance. This will see the XPS 13 absolutely tear through general computing tasks and up to handle a video encoding or spreadsheet lookup task with ease. We certainly had no issue running several apps at once on the device. But, we could easily see most PC games and other media-rich professional tasks giving this laptop a run for its money. Dell promises up to 12 hours of use from the 4K version of the XPS 13, derived from a MobileMark 2014 benchmark score. Meanwhile, the Full HD version lasts up to 21 hours in the same test. Of course, our tests produced nowhere near the same numbers, as is expected. However, our tests did show a marked increase in battery life year-on-year, particularly the local video playback benchmark. The XPS 13 lasted nearly three hours longer than the previous model in this test. General use is also going to see a boost in longevity, judging by this laptop’s result in the PCMark 8 Battery benchmark. In that test, we saw the 2019 XPS 13 last for 21 minutes longer than the 2018 model – an 8% boost, all told. You still won’t see all-day battery life from the 4K Dell XPS 13, but it’s vastly improved anyway, and the Full HD version will likely get you through an entire work day based on these numbers. Still, this is impressive longevity for a 4K display. Dell is unsurprisingly light on the unique software front, with just a few apps getting pre-installed on the operating system. McAfee or Norton antivirus suites are no longer included in lieu of a spattering of Dell-made apps. The most notable of which are Dell Mobile Connect, Dell Update, and Dell Power Manager. The former allows you to connect your Android phone or iPhone with your computer, managing it straight from the Windows 10 interface. Dell Update pulls in new support files straight from Dell when needed. Finally, Dell Power Manager provides detailed controls for your laptop’s battery and power profile that Windows otherwise doesn’t. As for unique hardware features, the optional fingerprint reader embedded into the power button is sleek and discreet while being speedy enough for fast logins. That said, we do prefer biometric login via infrared face detection, as it’s just that much faster. Dell has gone and made just about every possible improvement to the XPS 13 in 2019. The webcam is in the proper position and no worse in quality for what it took to get there. Better yet, battery life has seen a sizable improvement as well. This has happened all the while everything else about the laptop has maintained its storied, incredible quality, from the chassis design to the power profile of the components inside. This is the same laptop as last year, only better. 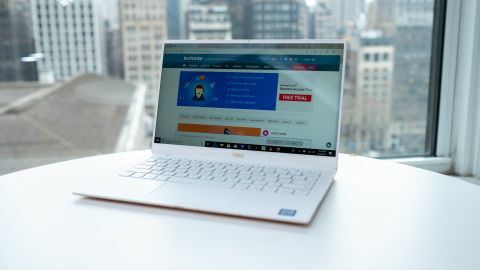 However, compared against the current best laptop 2018 and at the time of writing, the Huawei MateBook X Pro, the XPS 13 still struggles to compete on value. Simply put, you can get better hardware in all regards for less out of the Huawei laptop in both of its available configurations. While it’s not quite the ‘Best in Class’ laptop for 2019, we still consider the Dell XPS 13 among the best laptops in the world. TechRadar has reviewed hundreds of laptops so that we're able to offer you the authoritative buying advice you expect. Whatever you're looking for in a laptop, we've rounded up all the best options in our helpful buying guide so you can decide whether the Dell XPS 13 really is the best option for you. If you've' got your heart set on a thin, light and powerful laptop like the XPS 13 but want to browse some alternatives, take a look at our ultrabooks buying guide.